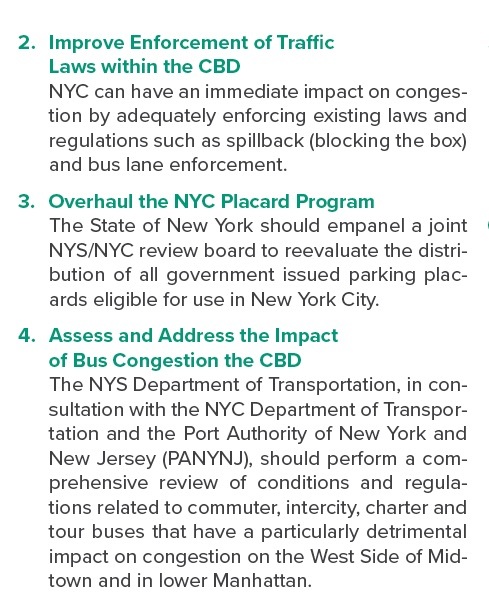 The panel also recommends to enforce gridlock laws and Bus lanes with cameras if feasible, to overhaul the placards program and to focus on the bus congestion on the West Side and Lower Manhattan . These recommendations are critical to bring relief to our neighborhood which sees more than its fair share of placard, gridlocks and buses. It gives us a platform to discuss the bus permitting system and its deficiencies, and hopefully find a way to put buses where they belong, in a garage and not on residential streets. We were fortunate that savvy New Yorkers were able to bring common sense and valuable information to the panel. Bravo Governor Cuomo. Now let’s turn up our sleeves. This entry was posted in CHEKPEDS, Clean Air, Congestion, pedestrian, Traffic Justice, Transit and tagged buses, laws, NYPD, NYSDOT, PANYNJ. Bookmark the permalink.